Basil plants are one of the most popular herbs to grow and also one of the easiest. Basil (Ocimum basilicum) is a member of the mint family. It is closely identified with Italian cooking, although it is originally from India. The extremely aromatic leaves also have a delightful variety of flavors, from the slightly lemony-mint of sweet basil to cinnamon, and licorice. Leaf colors span from rich green to deep purple, with smooth or crinkled leaves. The flowers are insignificant but very popular with bees. Basil plants can be grown as perennials in USDA hardiness zones 10 and above. For most, it is a tender annual that only lasts until the first frost and must be replanted every season. The size of your plant will depend on the variety, the growing conditions, and how much you harvest. The Sweet Basil variety can reach 6 feet tall but grows to about 2 to 3 ft. for most gardeners. Continually pinching and using your basil will coax it into becoming bushy, with more leaves. There are also short 6-inch dwarf varieties, which work especially well in pots. Basil is ready to start harvesting in about 60 to 90 days, from seed. Frequent harvesting or pinching of the leaves will keep your basil plants producing fresh leaves longer. You can pinch off individual leaves or take the tops off of a large plant if you need a large amount. You'll want to prevent your basil from blooming for as long as possible by harvesting or pinching off the top sets of leaves as soon as the plant reaches about 6 inches in height. If the plant sets flowers, it is on its way to going to seed and will not grow bushy and fill out with a lot of tasty leaves. Once a basil plant goes to seed, the existing leaves begin to lessen in flavor, so don't be afraid to cut and use it, as soon as possible. The flowers are edible, too, so don't despair if a few plants get ahead of you. Basil can be used in cooking, generally added at the end to keep its fresh taste and color. Basil can also be used fresh in salads, on sandwiches, or even as a wrap—around cheese cubes, for instance. Basil is traditionally planted alongside tomato plants. It's said they help each other grow, but it may just be for convenience in harvesting. However, basil does not need to remain in the vegetable or herb garden. Some of the shorter, purple varieties, like "Spicy Globe," actually make nice edging plants in the ornamental garden, if you don't have problems with animals eating them. And any type of basil can easily be grown in containers. Give each plant at least a 12-inch pot in a sunny site and it should do very well. Basil is a heat lover. Don't bother planting it until the daytime temperatures remain in the 70s and night temperatures are above 50 F. Seeds can be started indoors three to four weeks before your last spring frost date. 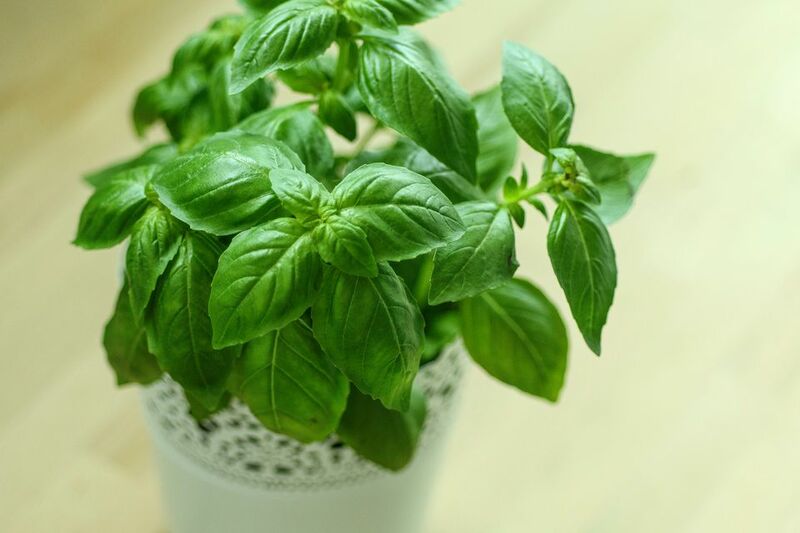 Unlike many Mediterranean herbs, basil likes a somewhat rich soil and doesn't like to be kept dry. Basil is very sensitive to frost and will be one of the first plants to go in the fall. You can extend the season slightly by covering your plants with row covers when frost is threatened. Don't let the row cover touch the leaves. Frost on the outside of the row cover is enough to damage the tender leaves and will likely turn them black. Genovese: This variety has larger leaves than Sweet Basil, with all the flavor. Cinnamon or Mexican Spice: Enjoy the green foliage, purple flowers, and spicy, cinnamon scent. Finissimo Verde a Palla and "Spicy Clove: ​These quick-growing compact plants are great for containers and edges. Lemon: This variety gives a fresh lemony tang to pesto, but its small leaves can be harder to harvest. The cultivar Sweet Lemon Dani or Sweet Dani has a lemon flavor and larger leaves. Red Rubin: This variety keeps purple color throughout the season with great flavor. It is wonderful for flavoring vinegar.